The risk of rotator cuff tears increases with age. The aging process can cause the tendons and muscles to degenerate and weaken. 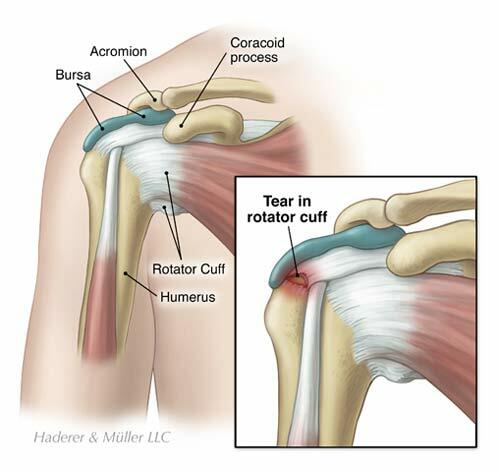 Rotator cuff tears can also result from sudden shoulder movements or overuse, for instance during sports, such as pitching in baseball or playing tennis, or falls. The decision on how to treat rotator cuff tears is very individualized. Some rotator cuff tears can be treated with non-surgical methods. However, surgical procedures have become less invasive, resulting in good outcomes with improved recovery times. Our shoulder is composed of three bones. The humerus is our upper arm bone. The clavicle is what we call our collarbone. The scapula is the shoulder blade that moves on our back. An edge of the scapula, called the acromion, forms the top of the shoulder. There are a total of four joints in our shoulder complex. The humerus and the scapula form the main shoulder joint, the glenohumeral joint. The glenohumeral joint is not a true ball-in-socket joint like the hip, but it is similar in structure. The top of the humerus is round like a ball. It rotates in a shallow basin, called the glenoid, on the scapula. A group of ligaments, called the joint capsule, hold the ball of the humerus in position. Ligaments are strong tissues that provide stability. In other words, the joint capsule is responsible for holding our upper arm in place at our shoulder. The four rotator cuff muscles form a single cuff of tendon that connects to the head of the humerus bone. The muscles allow the arm to rotate and move upward to the front, back, and side. A fluid-filled sac, called the subacromial bursa, lubricates the rotator cuff tendons allowing us to perform smooth and painless motions. We use the rotator cuff muscles to perform overhead motions, such as lifting up our arms to put on a shirt, comb our hair, or reach for an item on a top grocery shelf. These motions are used repeatedly during sports, such as serving in tennis and passing in football. The rotator cuff also provides stability when our elbow flexes and as we lift objects. Rotator cuff tears most frequently occur in the dominant arm but commonly occur in the non-dominant arm. The risk of rotator cuff damage increases with age. With age, the blood supply to our tendons decreases. This causes the tendons and muscles to degenerate, weaken, and become susceptible to tearing. Additionally, the tendon degenerates with age. The body’s ability to repair the tendon decreases over time because of the reduced blood supply. Sometimes the aging process can cause bone spurs to grow on the scapula, particularly in the acromion area. Shoulder impingement syndrome occurs when bone spurs or bursa inflammation narrows the space that is available for the rotator cuff tendons. The tendons can tear as they rub across the bone spur, particularly when the arm is elevated. Inflamed tendon membranes may develop tendonitis, a painful condition. 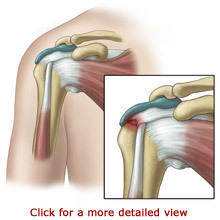 Shoulder impingement syndrome may even cause the rotator cuff tendons to detach from the top of the humerus. Rotator cuff injuries can occur in younger people following a shoulder injury, such as a fracture or dislocation. Overuse or repetitive activity can also cause rotator cuff tears. This includes athletes that perform overhead movements during such sports as tennis, swimming, or baseball. This also includes workers who reach upwards repetitively during construction, painting, or stocking shelves. The symptoms of a rotator cuff tear tend to appear gradually. You may first develop pain in the front part of your shoulder. Your pain may spread down the side of your arm. The pain may be mild at first and increase when you lift your arm or lower your arm from a fully raised position. Over time, the pain may be present when you rest and even wake you while you sleep. However, some rotator cuff tears are not painful at all. Your shoulder may feel stiff. It may be difficult for you to move your arm. You may hear a crackling noise when you do so. Your arm may feel weak, especially when your lift or rotate it. The symptoms of a rotator cuff tear caused by traumatic injury occur suddenly. You may feel a snap and sudden pain. Your arm will immediately feel weak, and you will have difficulty moving it. A doctor can evaluate your shoulder by performing a physical examination and viewing medical images. 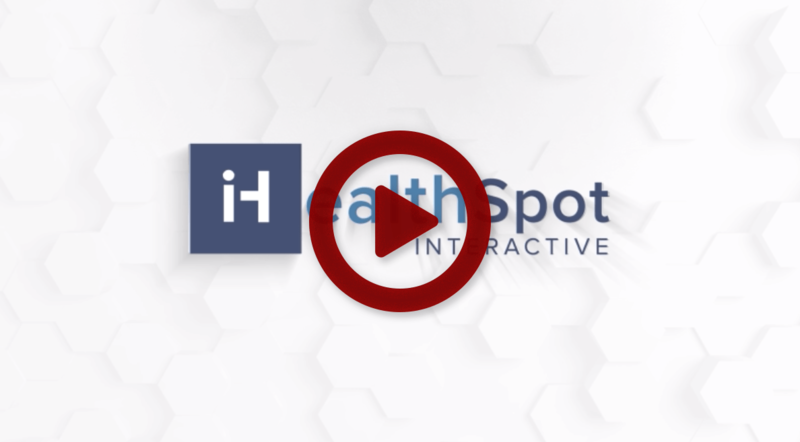 Your doctor will ask you about your symptoms and medical history. You will be asked to perform simple movements to help your doctor assess your muscle strength, joint motion, and shoulder stability. Your physician will order X-rays to see the condition of the bones in your shoulder and to identify arthritis or bone spurs. A special dye may be used with the X-ray in a procedure called an Arthrogram. Sometimes a soft tissue injury does not show up on an X-ray. In this case, your doctor may order a Magnetic Resonance Imaging (MRI) scan or an ultrasound. A MRI scan will provide a very detailed view of your shoulder structure. It will help your doctor determine the location and type of your rotator cuff tear. An ultrasound uses sound waves to create an image when a device is gently placed on your skin. These tests do not hurt but require that you remain very still while a camera takes images. Many rotator cuff tears can be treated with non-surgical methods including rest and pain relief. Limiting overhead arm movements and wearing a sling may help to reduce symptoms. Over-the-counter medication or prescription medication may be used to reduce pain and swelling. If your symptoms do not improve significantly with these medications, your doctor may inject your joint with corticosteroid medication. Corticosteroid medication is a relatively safe pain reliever. Physical and occupational therapy can be helpful to restore strength and function. Surgery is recommended when non-operative treatments have provided minimal or no improvement of your symptoms. Surgery may also be recommended for painful injuries or for people who rely on their arm strength for work or sports. There are several types of surgeries that can be performed for rotator cuff tears. The type of surgery that you have depends on the size, shape, and location of your tear. Partial rotator cuff tears may only require debridement. This surgical procedure simply trims the tendon. Suturing the tendon together repairs a complete tear. Additionally, tendons can be reattached to the bone. Many of these surgeries can be done as outpatient procedures. You will be anesthetized for the surgery. Three common surgical approaches include Open Surgical Repair, Mini-Open Repair, and Arthroscopic Repair. Open Surgical Repair is the original type of surgery for rotator cuff tears. 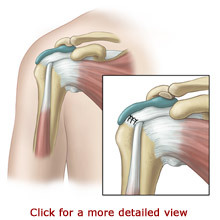 During Open Surgical Repair, the surgeon opens the shoulder complex to gain access to the torn rotator cuff. Your surgeon will make an incision over your shoulder and detach a small portion of the deltoid muscle for the surgery. An Acromioplasty is often performed at the same time. An acromioplasty removes bone spurs from underneath the acromion. A Mini-Open Repair of the rotator cuff is a variation of the Open Surgical Repair. The Mini-Open Repair uses much smaller incisions, typically three to five cm. in length. The deltoid muscle is not detached in this procedure. Instead, the surgeon views and evaluates the joint using an arthroscope. An arthroscope is a very small surgical instrument. It is about the size of a pencil. An arthroscope contains a lens and lighting system that allows a surgeon to view inside of a joint. The arthroscope can be attached to a miniature camera. The camera allows the surgeon to view the magnified images on a video screen or take photographs and record videotape. With this technology, your surgeon will only need to make small incisions and will not need to open up your joint fully. The arthroscope is used to remove bone spurs under the acromion and to treat other structures in the shoulder joint. Your surgeon will then use a mini-open incision to repair the rotator cuff. Results of the Mini-Open Repair are equal to the Open Repair surgical method. Another option for rotator cuff repair is All-Arthroscopic Repair. This technique is commonly used to reconstruct ligaments or remove damaged tissue and bone spurs. Arthroscopy is less invasive than traditional surgical methods. It has a decreased risk of infection and a shorter recovery period. Your surgeon will make one or more small incisions, about ¼” to ½” in length, near your shoulder joint. Your surgeon will fill the joint space with a sterile saline (salt-water) solution. Expansion of the space allows your surgeon to have a better view of your joint structures. Your surgeon will insert the arthroscope and may reposition it to see your joint from different angles. Your surgeon may make additional small incisions and use other slender surgical instruments for surgical treatments. Because the surgical incisions are so small, they will require just a few stitches or Steri-Strips. Your surgeon will cover them with a bandage. Your shoulder will need several weeks to heal from the surgery. Your surgeon will restrict your arm movements for a short period of time following your procedure. You will most likely wear an arm sling for four to six weeks. An occupational or physical therapist will gently help you move your arm at first, and then you will progress to strengthening exercises. Overall, arthroscopic shoulder surgery requires a shorter length of time for recovery than open joint surgery. It also has a reduced risk of infection, less blood loss, and less pain and stiffness because only small incisions are used and less surrounding tissue is affected or exposed. Most individuals achieve good results with rotator cuff repair. All methods of surgery appear to produce equal results. It may be helpful to exercise to maintain a strong, stable, and flexible shoulder. Avoiding repetitive overhead movements may help to prevent rotator cuff tears. Further, it is important to follow your doctor’s instructions for any weight lifting or motion restrictions. Copyright © Greenwood Orthopaedics. All Rights Reserved.